The Bold and the Beautiful (B&B) spoilers tease that Bill (Don Diamont) is planning a huge shocker for November sweeps. Before he resorts to his nastiest plot yet, Bill will try a nicer route. We can at least give him credit for that. Bill will approach Liam (Scott Clifton) with an enticing offer. He’ll hope that this proposal will satisfy Liam, Sally (Courtney Hope) as well as himself. Bill still wants to build his skyscraper and the Spectra property is the perfect location. As a result, Bill will agree to give Sally a brand-new building somewhere else. He’ll insist that he’ll pay for all the moving expenses and hire plenty of help for Sally. Bill will argue that Sally can have it set up however she wants it. He’ll think that this is an extremely generous offer and it is. Unfortunately, Liam will immediately dismiss the idea. He might contend that Sally shouldn’t have to disrupt her work schedule. Plus, B&B fans know this is her family’s property. Liam probably won’t think Sally needs to give up a piece of history. Of course, part of Liam is undoubtedly just stubborn. He won’t want to budge on this and let Bill have exactly what he wants. Once Liam rejects the suggestion, Bill will return to his usual playbook. The Bold and the Beautiful spoilers say Bill will rely on Justin (Aaron D. Spears) for another evil scheme. This time Bill will want to make sure Spectra is truly a pile of rubble. He’ll plan to blow up the Spectra building and force Sally to find another location. Liam and Sally will determine that Bill is plotting something, so they won’t leave the premises. They’ll plop themselves in Spectra headquarters and refuse to go anywhere. Once Justin realizes Sally and Liam are going to be a problem, he’ll text Bill about the situation. Alas, Bill won’t see the text before he gives the order to blow. Come on, Justin! When explosives are involved, the least you can do is make an actual call or rush over in person. You’d think Justin would try a little harder to get in touch with “Dollar Bill.” Nevertheless, Bill will give the greenlight and it looks like the Spectra building will come crumbling down. Once Bill finally gets updates, he’ll fear that he just killed his own son! 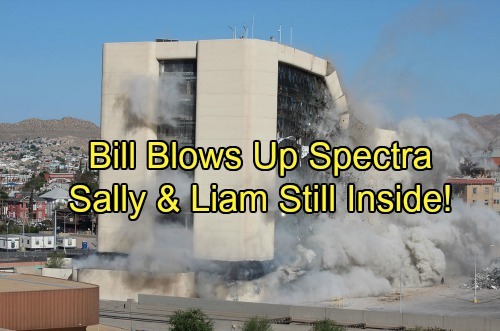 Bill will be horrified, but Sally and Liam should escape with their lives. Still, you can bet that this will reignite the Spencer war in a big way! We’ll keep you posted as other Bold and the Beautiful news comes in. Stick with B&B and don’t forget to check CDL often for the latest Bold and the Beautiful spoilers, updates and news.